Punch Number Two was the September 11 release of a new book, Fear: Trump in the White House, by Bob Woodward, the longtime investigative reporter for The Washington Post—although “the good stuff” from that book has been floating around for a while. Anonymous wrote that he—that was the pronoun the Times used—was a top official and that he, joined by others, was working diligently to thwart the crazy Trump agenda. And Woodward, meanwhile, wrote that Trump is suffering from “a nervous breakdown” and that amidst the overall cray-cray, some wise staffers were working to “purposefully block” Trump’s worst policy decisions. So we can see: Anonymous and Woodward have painted much the same scenario. In fact, as many observers have pointed out, there was nothing, really, in the work of either Anonymous or Woodward that hasn’t been said before, many times. That is, if you want to believe the worst about Trump, well, you already had the Michael Wolff book, or the Omarosa book, or, of course, the mutterings of just about every day’s Times or Post—as well as a host of lesser publications—over the past couple of years. We can pause over some of Mrs. Trump’s words: “unidentified,” “no names.” Yes, indeed, it would seem that events are being pushed along by hidden little mice. Why, some might even be tempted to say that there’s been collusion, what with each clandestine activist writing and/or leaking in a sort of secret symphony. Needless to say, the Deep State prefers to deny that there’s such a thing as the Deep State. And its handmaidens rush to agree: As The New York Times headlined it last year, the Deep State “doesn’t exist.” And former CIA director Michael Hayden wants you to buy his book, so that you can you read all about how there’s no such thing, nosiree. In the meantime, the MSM is flacking for both Anonymous and Woodward, bigtime. CNN and MSNBC, for instance, led with the twinned stories for a week; panel after panel fretted about the presidency, taking only the briefest of breaks to report on the continuing good economic news. Yes, Hurricane Florence has intruded for the time being, but we know the MSM will get back to its favored Trump-Is-Nuts storyline soon. So with that out of the way, it still might be worth taking a closer look at Anonymous and Woodward. As for Anonymous, the big question, of course, is who? Some, including Fox News’ Greg Gutfeld and Jeanine Pirro, have speculated that Anonymous is a simple Times hoax. Yet for a right-of-center pundit, this is a risky stance to take, because the MSM have so much invested in the Times’ infallibility. In fact, it seems fair to say that the Times is the sacred queen bee of the media, and so all its dutiful drone bees will do anything to protect it. For instance, when Candace Owens, the iconoclastic black activist, suggested, too, that Anonymous was a fake, Mediaite responded on September 8 by labeling her as its “Media Loser” of the day. As the site put it, “This is a wholly absurd suggestion. To in any way imply that The New York Times put its 167-year legacy on the line by fabricating a piece this important is completely uncalled for. And Candace Owens knows it.” So we can see, if anyone dares to question the Times, all the drones in the hive will start dive-bombing the questioner. It’s also possible that there’s a blend going on; that is, someone real wrote the op-ed, and yet the Times inflated his status, making him more “senior” than he really is. As a conservative documentarian, Phelim McAleer, has noted, the Times has been caught doing just that. Okay, so now to the second puncher. The MSM endlessly assures us that Woodward has an sterling reputation for accuracy. 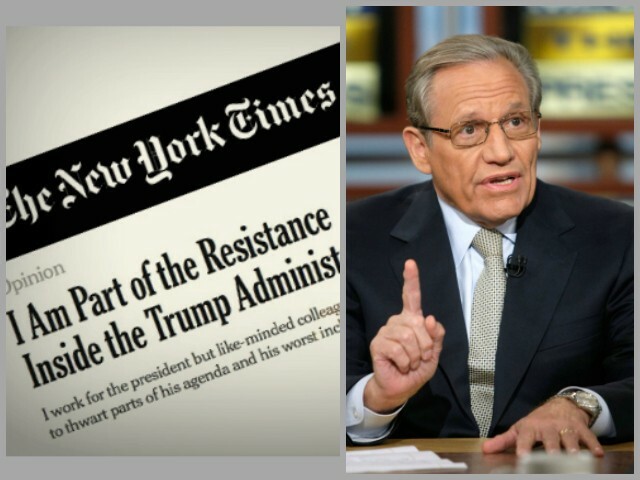 The rave review of his latest book in The Washington Post attests, in the headline, that their colleague is “meticulous.” Seeking to clinch the point, one of Woodward’s former colleagues at the Post, David Maraniss, has informed his MSNBC audience that Woodward has whole filing cabinets full of documents. Any questions? Well, actually, Woodward’s credibility has been challenged plenty of times in the past. Furthermore, it’s being challenged today. Many of the aides and former aides that Woodward quotes as saying unflattering things about Trump have either denied they said such things (John Kelly, Jim Mattis), or said that Woodward made at least some errors or distortions (Gary Cohn, Rob Porter). Yet whether or not Woodward has his facts straight, there’s another question: Is Woodward just a well-rewarded tool of the Establishment? Someone who will use his reporting and book-writing to do its bidding? It’s not at all hard to believe that Woodward is an Establishment asset. After all, he’s been a fixture of the Georgetown social scene for more than four decades; it’s more than reasonable to conclude that during that time, he has mind-melded with the swamp-dwellers. As such, he has become, as many have said, just a stenographer for the powerful. And by “powerful,” we don’t mean anyone so transitory as a U.S. president; we mean the permanent government—aka, the Deep State. By this reckoning, it makes perfect sense that Woodward’s assessment of Trump reflects the thinking of those who hate Trump. That is, the thinking of those who believed that everything was fine in the Obama years, or the Bush 43 years, or the Clinton years. You know, all the years prior to Trump, when the swamp was getting swampier. A case in point is trade policy; as we’ve come to see, one of the articles of abiding faith for the elite is that globalism is the wave of the future. And so in the elite’s mind, Trump’s renegade America First-ism must be squashed like a bug. Thus Woodward, being ever obedient to the globalist view, opens his book with what he sees as a revealing anecdote about Trump’s menace. The issue at hand was the U.S.-Korea trade deal; Trump had been thinking about withdrawing from it, and, in fact, had the withdrawal letter on his desk. And yet then-White House aides Cohn and Porter are said to have filched the letter from right under Trump’s nose, thus saving the day. In Woodward’s view, the moral of the story is simple; as he says, “People better wake up to what’s going on.” Translation: Get Trump! Of course, many others, outside the Beltway, will wonder why so many Washingtonians are clutching their pearls. Yes, D.C. lifers, snug and smug inside the Beltway, have their steady supply of gossip about the president they love to hate. Yet in the meantime, ordinary Americans have their peace and prosperity, as well as a leader who actually stands up for them—and stands up to the likes of Woodward and Anonymous. Aggregated From: Politics - New York Daily News LOVETT: Cuomo vulnerability was more hope than reality In the end, Gov.